Recently I seem to have been pixy-led into pondering the question of American fairies. Are there American fairies? If so, what is their origin? Did they arrive here in the luggage of immigrants or mate with indigenous fairies? Today’s fairy-tale comes from New Hampshire—from Hampton, a town associated with the uncanny General Jonathan Moulton, said to have sold his soul to the Devil. Curiously, this New England devil has some characteristics strangely like those of the Gentry. Old Hampton is a strange place—at least it was so once, when the oldest inhabitants who now live there, and who were among its first settlers, were in their younger days. It was strange, because superstitious; and many tales are now related, which show that the people were not less given to ill-advised ways than the chief actors in the Salem witchcraft. One of the most absurd stories which ever came to my ear, but which an hundred years ago, was considered by the old women as true as the Bible, is related of a man who was unfortunately murdered in the woods near the old Baptist meeting-house, on the Portsmouth road. “Everyone feared to go through these woods in the night, as the trunk of the murdered traveler, without any head, would appear above the trees, crying ha-lo! Ha-lo!” How a man could “cry” without the use of his head—that’s the question. Another story, of somewhat later date, concerning the appearance of his majesty, “Jimmy Squaretoe,” is more likely as well as more fashionable. Near the old burying ground, which is situated at the farther extremity of what is called “The Ring,” a circular road that surrounds about forty acres of land in the centre of the town, a small ten foot building is now standing, which was owned and occupied by one Nat J___N. [Nathaniel Johnson] This man had one niece and two daughters, who lived with him. To them, it is said, an “unknown cat, which afterwards changed into a little man, dressed in leather, appeared at different times, and under strange circumstances.” For what purpose this visit was intended, I never understood, nor do I know the characters which Nat and his family bore. But the “little man in leather,” who was represented to be the size of a grown cat, was never known to visit any but his own children, or those whose care had been confided to his superintendence. Jimmy, as he was called, was a brisk little fellow, and he followed Nat’s niece and daughters all about. They could not get rid of his presence. He was everywhere, as the unknown cat had been before him. His favorite place, where he was ever constant when anything was doing inside, was at the window of the young ladies’ bed chamber. Whether Jimmy ever pushed the door open, or shoved up the window, which he might have done when the girls were asleep, the story does not tell—or how long he continued to wait upon his children, in the leather dress, appears equally uncertain; but that this apparition was the devil himself, no one has ever been heard to doubt, because many persons of the highest respectability had seen his worship in the leather dress walking about in the adjoining graveyard, and when he followed Nat’s girls about. As his majesty had some thing to do in another quarter of the town, is the reason perhaps that his honors for a time were divided. But they became friends again, and were seen walking together. Well, as I heard it, it was “Jimmy Squaretoe,” the little man-in-leather, who was seen in company with the General, after they had become reconciled. It was not long after this circumstance that the old General died, and was buried—yes, the coffin was buried, or was ready to be, but the body of the defunct General was not, to all accounts. The deceased, as usual, was laid out and put into the coffin, but on the succeeding day, when all was arranged for the dread solemnities of a great funeral, on lifting the lid to take a last farewell peep—lo! The coffin was empty! The little man-in-leather, to the fulfillment of his bargain, had taken possession of his prize, and with it, perhaps, flew to the infernal regions, though it is said that the little-man-in-leather is still occasionally seen in different parts of the town. To be Relentlessly Informative, Moulton, a hero of the French and Indian Wars and the Revolutionary War, seems tailor-made for the “New England Faust” role thrust upon him by folklore. Still, he either had or cultivated an aura of mystery. He seems to have been a quarrelsome sort, always getting into feuds with his neighbors. He kept a massive black dog, obviously an emissary of Satan. According to local lore, when Moulton’s first wife, Abigail, died of smallpox, he remarried a friend of hers named Sarah a year later, using the ring with which he had wed Abigail. Sarah said that the ghost of Abigail came to their bed and pulled off the ring, which was not seen again. There was some jiggery-pokery about his burial; his tombstone was said to have disappeared; and to this day no man knows the site of his grave. A fitting character indeed, to duel with the Devil. But that Devil is a strange one. Most stories (and even most of the ones about Moulton) speak of the usual debonair Prince of Darkness, the Man in Black Velvet. Although the Devil sometimes shape-shifts and the cat is the favored familiar of his minions, the little-man-in-leather does not seem to possess the full-sized authority of His Satanic Majesty. How can he, being only the size of a “grown cat?” And, well, why leather? It is not a good look… The author seems to be conflating two altogether different supernatural entities. Possibly we might even speculate about a third “entity,” the poltergeist, being behind the persecution of the Johnson girls. Jimmy Squaretoe seems more of a pest than the Father of Pestilence. Oddly, there is a report of an anomalous “little man in leather” from 1952 Iowa. 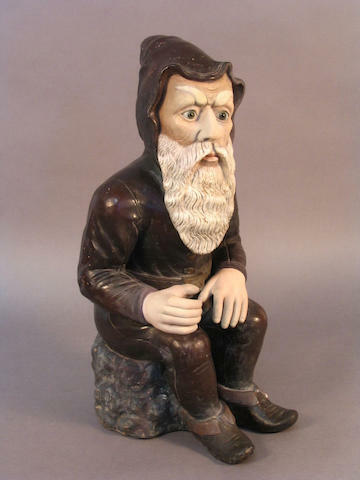 Two young men were driving across Iowa on one of that state’s long straight roads through the wheat fields when they saw “a little old man on a bicycle, wearing lederhosen and sporting a long white beard, like something one might see rendered in wood in a Bavarian souvenir shop.” The young men were startled by this odd, if energetic apparition, but assumed he was riding his bicycle to visit some neighboring farm. About a half an hour later, however, they came over a slight rise and saw the same little old man in lederhosen still pedaling along. The road had not changed direction; there were few, if any side roads, and they could not remember seeing anyone passing them who might have given the old man in the leather shorts a lift. 3-11-17 A reader kindly sent in several little-men-in-and-out-of-leather items, although noting that the one from Harry Anderson, Barron, WI at the end of the Fate article was a bit suspect due to some author alterations. Many thanks! I saw your Jimmy Squaretoe post and have Stateside stories for you both of little men in leather pants *and* tiny devils. “Spirit Mound was alternately described as a “mountain of evel spirits”, a “hill of little people”, and a “place of Deavels.” The Sioux, Omaha, and Otoe tribes told of 18-inch tall humans with “remarkable large heads” who inhabited the site. Armed with arrows [MY NOTE: elf-shot?] , these spirits attacked anyone who approached the hill. What did Lewis and Clark expect to find there? An entry on “Lewis and Clark and the Little People” appears in vol II of “Explorations Into the World of Lewis and Clark“. (The book was published in 2003 but it is a compilation of essays from a Lewis and Clark research periodical called “We Proceeded On”.) The wikipedia article on Spirit Mound also cites an academic article on the Lewis and Clark journals that provides a little more info, namely that the taboo on the Mound began with the Lakota (who told of a massacre by the little people of hundreds of their warriors) and was subsequently adopted by the Omaha and Otoe. A final (non-Stateside, not tiny) note: The first thing I thought of when I saw the name “Jimmy Squaretoe” was “Jimmy Squarefoot”, a giant pig-headed boar-tusked entity from Manx folklore. A curious similarity in the names.